As we know Google has launched a brand new social networking service to against the ever growing Facebook, named Google+. The service is currently invite only(If you want an google+ account then contact me via contact form), but is getting a lot of attraction from early users (including me). In case you are already on Google Plus and wishing to move all (or selected) Photo albums from Facebook to Google+, you would first need to transfer the photos to your Picasa account and then link them up on your Google+. But wait, you can do the same thing easily in just a couple of clicks using Move2Picasa! As we would expect, the time required for transferring is directly proportional to the number of photos you have in Facebook & also the current number of photos in the transferring queue of the service. 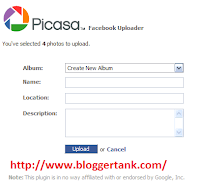 For now, you will be forced to transfer ALL your photos (and albums) to Picasa. But I hope the developer provides an option to pick and choose the albums we like to transfer to Google+. Also, as you know that your status will not refresh automatically so frequently refresh your move2picassa dashboard for the updates status. But I want to tell you in transferring the photos I didn’t encounter with any problem. So I think that there is also not any problem to you all also. Since All the photo albums uploaded on Picasa to have its default privacy option set. So do check and adjust the sharing options to make sure the photos are visible to only those you wish to share the photos with. 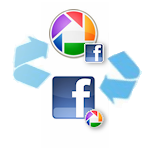 If you want to have more control on which photos you want to transfer from Facebook to Google+, check out PicknZip. This app lets you browse through the Facebook photo albums and select the ones you wish to download. The service will zip the selected photos and lets you download it in a flash. Once you have downloaded the file, unzip it on your PC/mac and upload them to Google+. And yes, it’s not as easy as Move2Picasa, but a nice bargain for the flexibility you are getting. You can even drag n drop the photos directly on to your Google+ profile!